↑ Abdel-Misih, Sherif R. Z.; Bloomston, Mark (2010). 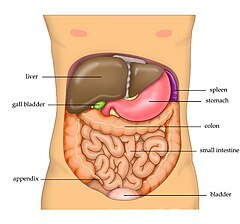 "Liver Anatomy". Surgical Clinics of North America খণ্ড 90 (4): 643–53. doi:10.1016/j.suc.2010.04.017. PMID 20637938. ↑ 3.0 3.1 "Anatomy and physiology of the liver - Canadian Cancer Society". Cancer.ca. http://www.cancer.ca/en/cancer-information/cancer-type/liver/anatomy-and-physiology/?region=on। আহৰণ কৰা হৈছে: 2015-06-26. ↑ "Principles of Anatomy and Physiology - Gerard J. Tortora, Bryan H. Derrickson". Books.google.co.za. https://books.google.co.za/books?id=uNwfOPPYgKAC&pg=PA945&dq=liver+anatomy+and+physiology&hl=en&sa=X&ei=0FV1Va6PI-iX7QaFkYCQCQ&ved=0CBwQ6AEwAA#v=onepage&q=liver%20anatomy%20and%20physiology&f=false। আহৰণ কৰা হৈছে: 2015-06-26. ↑ Maton, Anthea; Jean Hopkins; Charles William McLaughlin; Susan Johnson; Maryanna Quon Warner; David LaHart; Jill D. Wright (1993). Human Biology and Health. প্ৰকাশক Englewood Cliffs, New Jersey, USA: Prentice Hall. ISBN 0-13-981176-1. OCLC 32308337. ↑ Zakim,, David; Boyer,, Thomas D. (2002). Hepatology: A Textbook of Liver Disease (4th সম্পাদনা). ISBN 9780721690513. ↑ "Etymology online hepatic". http://etymonline.com/index.php?term=hepatic&allowed_in_frame=0। আহৰণ কৰা হৈছে: December 12, 2013. ↑ "Etymology online hepatos". http://etymonline.com/index.php?term=hepatos&allowed_in_frame=0। আহৰণ কৰা হৈছে: December 12, 2013. ↑ "Medscape: Medscape Access". Emedicine.medscape.com. 2015-03-09. http://emedicine.medscape.com/article/1900159-overview#aw2aab6b3। আহৰণ কৰা হৈছে: 2015-06-26.